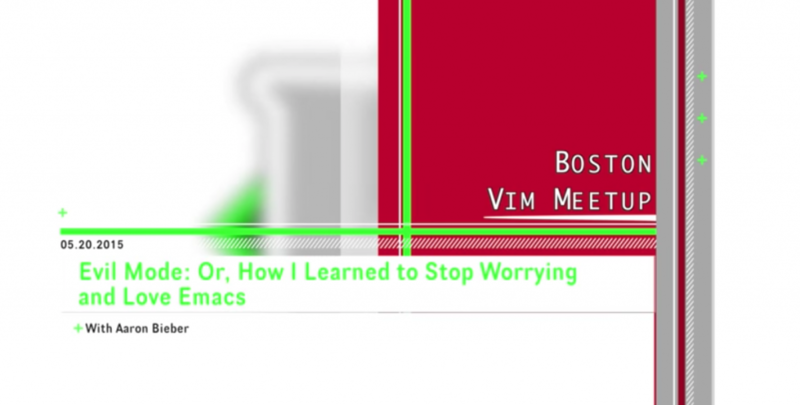 I can’t believe I’m writing a post about vim and emacs in the year 2015! But our very own Aaron Bieber just spoke at the vim meetup on how he’s been secretly using emacs all the time for a few months, and is now coming out of the closet as an emacs user. Vim vs. emacs is an eternal holy war, and pretty much the opposite of a topic that I would normally want to write about. But Aaron is the opposite of a holy warrior, as anyone at Wayfair Engineering can tell you. Here’s the announcement of the talk: http://www.meetup.com/The-Boston-Vim-Meetup/events/222395931/, here’s his personal blog post on the topic: http://blog.aaronbieber.com/blog/2015/01/11/learning-to-love-emacs/, and here’s the video: https://www.youtube.com/watch?v=JWD1Fpdd4Pc, with cool jazz! Evil mode is what makes this possible, of course. I used to be Aaron’s manager, and as someone who has used his .vimrc / .vim-folder setup, after watching this talk I’m at least going to try his .emacs file, as an adjunct to my crusty old pseudo-Python-IDE thing. As an engineering manager, the key comment to me was the thing about how ctags (for tab completion) works just as well in both environments. As long as people are using something that helps them save time that would otherwise be spent on meaningless drudgery, to each his own!